This level has medium difficulty. 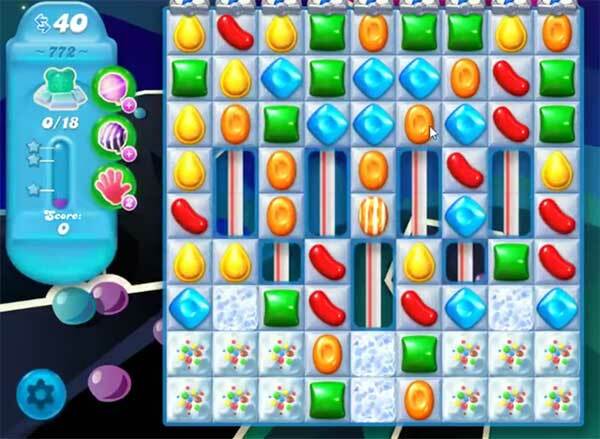 For this level try to play more from the bottom part of the table to shuffle the candies and make special candy as you get the chance. Combine them with each other to break more snow blockers or play near to snow blockers to break them to find the bears. YOU MAKE IT LOOK EASY I GUESS I’M TO DUMB. I LOVE PLAYING THE SAME DUMB GAME FOR OVER A MONTH, OVER, AND OVER, AND OVER AGAIN I GUESS I’M THE DUMB ONE. I’M ON A FIXED INCOME SO I CAN’T BUY BOOSTERS. LOVE THE GAME BUT SPENDING A MONTH OR LONGER ON THE SAME LEVEL REALLY IS DUMB. Be prepared to play this level dozens of times … I played Level 772 at least 50 times and still didn’t find all of the bears. Yes, it takes skill, but it also take a LOT of luck, which I haven’t had on this level. I’m guessing that either I’m going to quit play CCSS altogether because I’ll never pass this level or I’m going to have to pay for extra moves to find all of the bears, which I don’t want to do.